Beautiful apartment for 8 people at the beach of Piles area of ​​valencia next to the beach of gandia by the sea, very nice terrace direct access to the pool, 3 bedrooms with new bedding with wardrobe and 2 bathrooms, kitchen and living room with 2 sofa bed, the bedrooms and the living room are team of ceiling fan, housing very appreciated by the tenants, votive festivals are the first fortnight of August, the parades of Moors and Christians in Oliva between 15 and the July 30 very beautiful holidays to see, the beach is very clean with games for children and fine sand. PAYMENT BY CHECK ACCEPTED VACATION. We spent a very relaxing week in this apartment. It is very clean, has everything you would expect and in great condition - its serviced by the owners and has good quality bedlinen and towels. We felt very secure in the apartment. 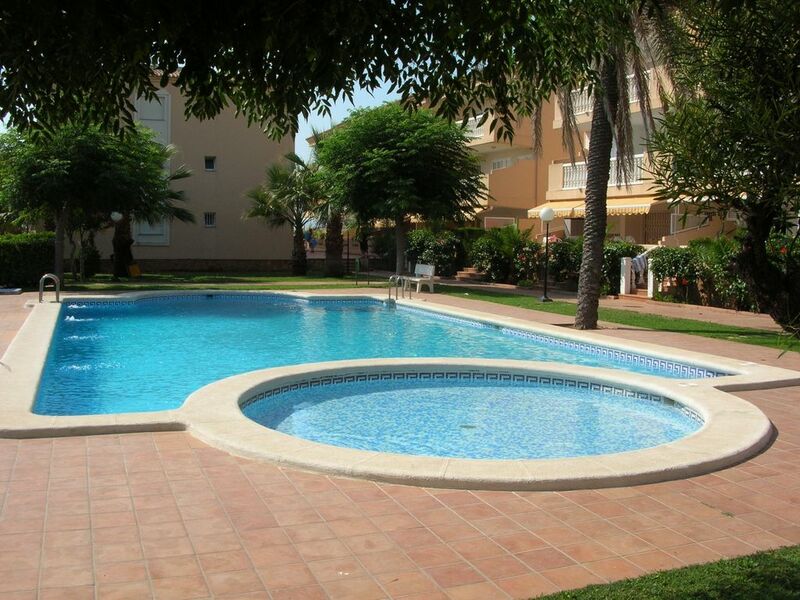 The apartment block is smart with a very nice pool and has great access to the beach. The balcony has fantastic sea views and on breezy afternoons you can watch the many kitesurfers who use this beach. A restaurant called Placebo has opened just a walk across the beach and this is perfect especially for non-Spanish as they accommodated us in the early evening with good food and great service at a reasonable price. No air con but fans are provided. There was just the two of us and I think it might be a bit cramped with 4 adults (the second bathroom is very small) but ideal for 2 adults and 2 children. Overall an excellent apartment and I would certainly book it again. Nous avons passé un séjour très agreable à Piles. L'appartement était grand, lumineux et très bien agencé. Les propriétaires sont très accueillants et disponibles. Face à la piscine et à 50m de la plage, nous avons profité du soleil et passé d'excellentes vacances. Je recommande cette location et j'espère que nous pourrons revenir prochainement. tres bon sejours dans un appartement tres lumineux et tres propres ,avec un acces direct à la piscine, le voisinage est tres bien, et le proprietaire tres accueillant,je conseil cette location à une famille avec enfants ou entre couples , vous n' aurez pas de mauvaise surprise .